Solid face pulley material build-up is a dangerous and time consuming clean up process. The solution is a Monarc Wing Pulley. The pulley rotation automatically starts the self cleaning action, discharging foreign material to the side of the conveyors. Durable individual deflectors are welded continuously to a hub for extreme product life and minimal belt wear. The Monarc design also prevents belt misalignment and prolongs belt life as the possibility of material build-up is greatly reduced. 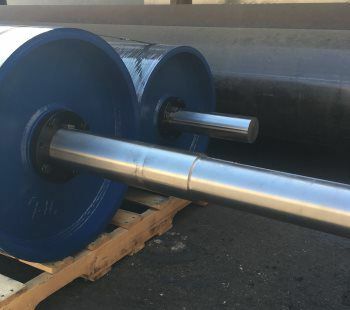 Monarc Wing Pulleys are available in a complete range of standard sizes with diameters from 6" to 42" and face widths from 6" to 66". 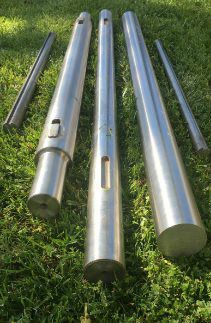 Custom applications are available and manufactured to your specifications. 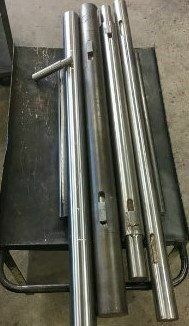 We also offer a complete line of shafting with machining to meet your needs. Lagged Wing Pulleys are also available.